BRUSSELS (Reuters) - NATO leaders will try on Thursday to move beyond Donald Trump's demands for higher defense spending, and focus on ending the long war in Afghanistan, in the second day of a summit in Brussels underscored by transatlantic tensions. 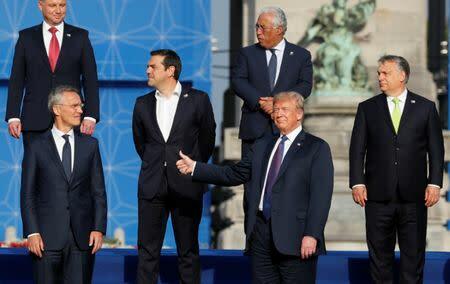 On a trip that will also take the U.S. president to Britain and to Helsinki to meet Russia's Vladimir Putin, Trump spent the first day of the NATO summit lambasting allies for failing to spend the targeted 2 percent of GDP on defense and accused Germany of being a prisoner to Russian energy. On day two, leaders will welcome non-NATO partners including Afghan President Ashraf Ghani and Ukraine's Petro Poroshenko to the alliance's new glass-and-steel headquarters as they seek to focus on policy rather than politics. Britain's Prime Minister Theresa May tried to set the tone on Wednesday by announcing more troops for NATO's Afghan training mission. "We will be deploying an additional 440 personnel to NATO's Resolute Support mission in Afghanistan and I think that shows when NATO calls, the UK is one of the first to step up," May told reporters. NATO's chief Jens Stoltenberg wants leaders to agree to fund Afghan security forces until 2024, despite public fatigue in Western countries about their involvement in the conflict. Funding has averaged at about $1 billion annually and Stoltenberg has said he expected that level to be met. U.S. officials have told Reuters Washington is preparing another review of strategy, a year after Trump begrudgingly agreed to extend involvement in the 17-year-old war. Trump was opposed to remaining in America's longest war, but his advisers convinced him to give it more time. He authorized the deployment an additional 3,000 troops, bringing the total to around 15,000. At the summit, leaders will discuss ties with Georgia and Ukraine, two NATO membership hopefuls who contribute to troop levels in Afghanistan but have seen their chances of joining the alliance hampered by Russian incursions into their territory. Under NATO rules, countries with territorial conflicts cannot join the Western alliance and neither country is expected to progress in membership talks. Macedonia, however, which was formally invited to start accession talks on Wednesday, will be part of a special ceremony on Thursday as the alliance sets the stage for expanding to its 30th member state.